Much of the gameplay is typical of the MMO format: The player controls a character avatar which can be moved around the game world and interacts with other players, non-player (computer-controlled) characters (or "NPCs") and other entities in the virtual world. Camera angles can be switched between first-person and third-person options. Characters are improved by gaining levels. A character's level increases after it earns a set amount of experience points through the player versus environment (or "PvE") combat and storyline adventures. Characters' abilities are improved by increasing in level, but character skills must be purchased from specified NPCs after gaining a new level. 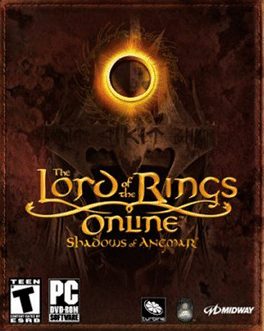 Tolkien's Middle-earth as represented in The Lord of the Rings Online implements magic in a different manner than other MMORPGs such as World of Warcraft. There are only five "wizards" in the fictional world, none of which are player-controlled. Instead, there are active skills which require "power" (the equivalent of magic points). Some skills behave like magic (like healing or throwing a burning ember at an enemy), but are based on "lore". In addition, objects and artifacts are used to create effects similar to magic.